Who was the most influential residential architect of the 20th Century that you never heard of? Royal Barry Wills. Who was the most influential residential interior designer of the 20th Century that you never heard of? Hazel Dell Brown. I wonder if they ever met each other. If I had a dinner party time machine, these two would be At The Top of My List! Above: Let’s discuss Anatomy of a Kitchen Design — Hazel Dell Brown for Armstrong Linoleum, Kitchen Design 1941. 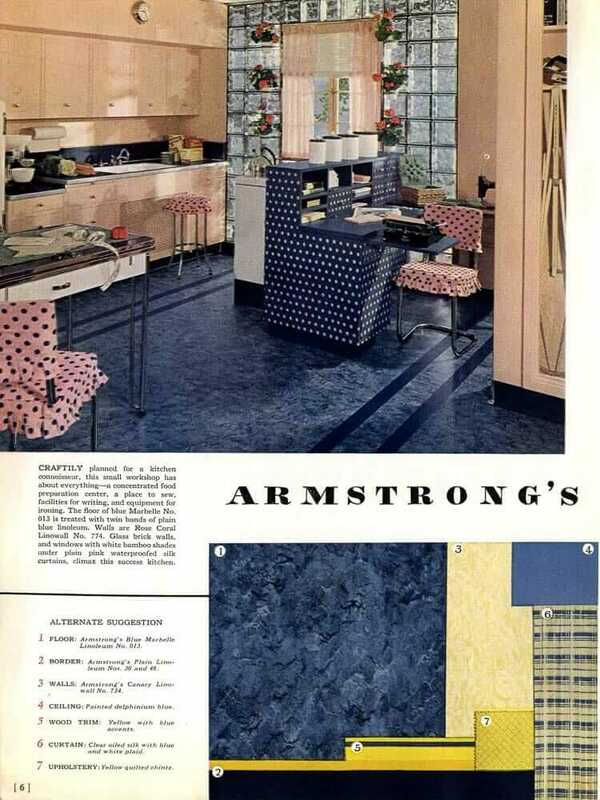 Mrs. Dell Brown was an Indiana home ec teacher hired in the 1920s by Armstrong to create aspirational rooms for their advertising. 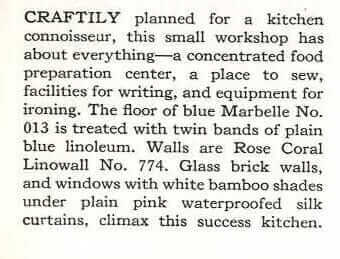 To understate it: She knew how to pull together a room. 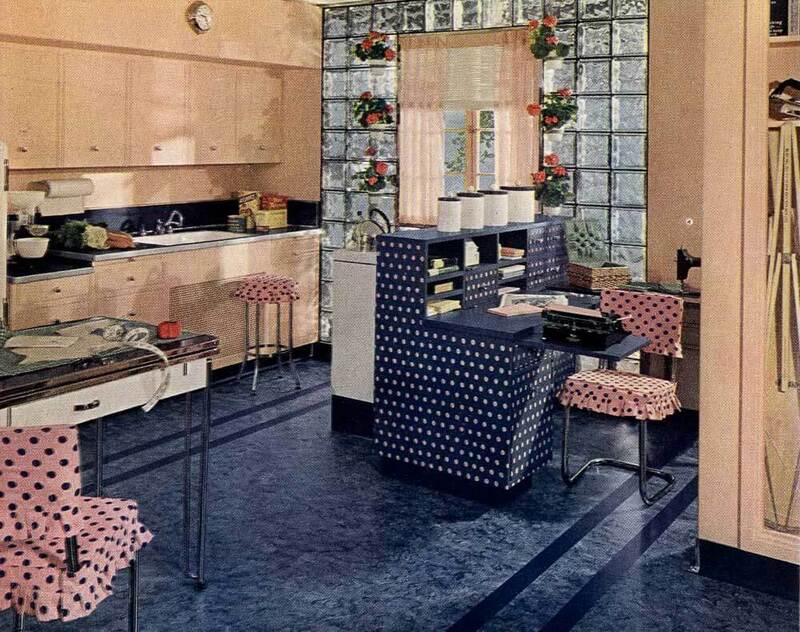 In this little piece of 1941 taffy delight, she shows us how to judiciously combine colors with a bit of eye-popping pattern — polka dots done positive and negative in two colorways, oh my! — to create a happy, airy kitchen. Hey, there’s even room for the Mrs. of the house to write a novel in between her time spent cooking and sewing up some more … ruffled upholstery. 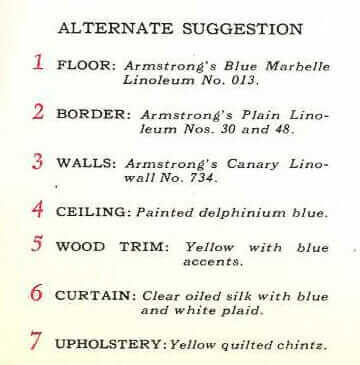 Dell Brown also gives us an alternate color pattern that includes a ceiling “painted delphinium blue”. I have just decided: Somewhere in my house, I need a ceiling painted delphinium blue. 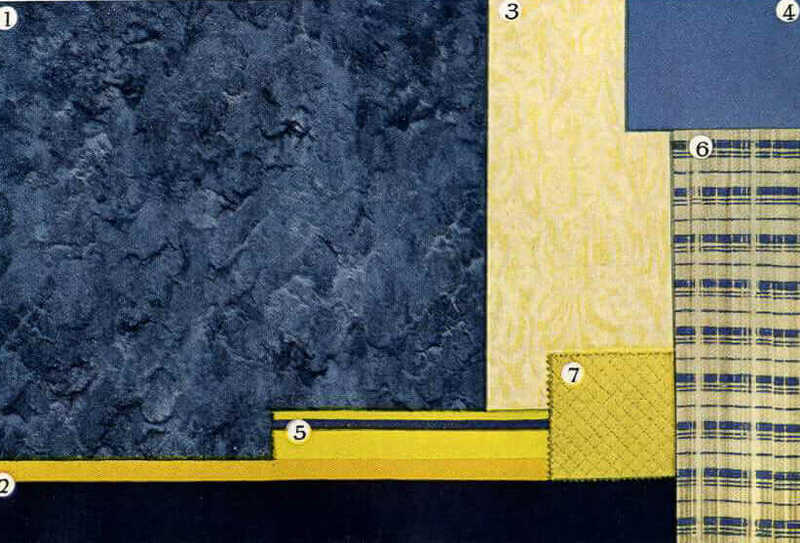 Note: The mood board above illustrates how ya build a room’s color/design palette: START WITH YOUR PATTERN. In this case, it’s the plaid on the curtain. Ya pull all the colors for your room from that first piece. Ta da. Thank you, Mrs. DB! Do you remember the story I did about the drawings of Louisa Kostich Cowan, the protege of Hazel Dell Brown? omg…I think we had that same color linoleum in our house when we moved in my mom’s house in 1968. The house was built in 1933. I’ve been thinking about going back to that so it was nice to see how it would look. thanks! On Indianapolis’ north side, suburb Carmel has a main thoroughfare named Hazel Dell Parkway. Now we know who she was. Thanks. That’s a neat little piece of retro that isn’t easily torn down! Of course Ganesha Avenue in Southern California was changed to the more lovely Fairplex drive. I really like how this kitchen had a designated space even for typing and sewing. I prefer this style to today’s large islands stuck in the middle. How often I’m sewing on a item and have something baking in the oven, course, writing thank you notes & checking email on the kitchen table. Thanks for this pic. It’s given me some great ideas for my next home. They were so practical back then. @Katharine Carroll, I’d much rather have a nice kitchen table in my renovated kitchen than an island. However, I’m going to need to put my cooktop/rangetop or wall ovens in an island. Our kitchen is too small and u-shaped and by installing an island we’ll make it about double the size it is now. Kitchen tables invite family and friends to hand around and talk after the meal, they’re good for kids doing homework and us adults paying bills and other adulating, they can be great work surfaces for us short bakers, and they’re wonderful for aging in place. Our current kitchen table will be moved to the Florida room/sunroom for family dinners. The kitchen table needs to make a comeback. There are currently a couple of stories on Houzz that us RetroRenovators might like. One was just posted and is about the glories of some vintage furniture pieces like telephone tables, roll top desks, dressing tables, and stereos. and the other is of a cool time capsule house in Austin with a teal kitchen, green bathroom and knotty pine panelling.